Blow molding typically refers to plastic blow molding. This is the process of “blowing” air into a plastic resin like a balloon that is soft or “melted” using heat and pressure. However, the “balloon” is restricted by the walls of a mold (referred to as a tool in the plastics business). When the plastic resin cools, it maintains the shape of the mold. Glass blowing has been a process for manufacturing glass vessels since the first century or before. With glass blowing a tube is inserted into molten glass and air is blown into it creating a bubble, called “free blowing”. The glass blower uses various skills, including turning the molten glass to keep it consistent in shape. As the glass cools different techniques are used to form shape. This process requires much skill to make consistently shaped vessels and containers. Glass bold blowing is an alternative to free blowing, where the molten glass is placed on a blowpipe and inflated by; then it is put in a mold to shape the external shape and surface such as texture. One-piece molds can be used for glass bowls, for instance, but a two-piece mold will need to be used if the shape will not allow removal of the hardened glass. This is very similar to the plastic blow molding case. While plastic resins have only been around a hundred years or so, the age-old concepts of making objects from malleable material (including molten metal) is similar to a millennium ago. See more about the history of plastic here. Plastic molding was commercially developed in the 1940s. As different plastics were developed, the cost and nature of plastic benefits began to be used more in the 1960s. The development of high-density polyethylene allowed development of the HDPE water bottles we all know today. Prior to this time most containers in the world were age-old materials like glass, ceramic, or metal. The blow molding technique borrowed from glass blowers was the inspiration for the early machinery that blew air into a glob of molten plastic and inserted into a mold to create the external shape. See Plastic Blow Molding Basics for illustration. This “glob” is called a parison. The parison contains the amount of plastic required to fill the mold shape. Compressed air blows the parison into a balloon-like shape until restricted by the walls of the mold. The mold comes apart, so the cooled, rigid plastic can fall out of the mold or tool. Machinery over the years has done more and more of the process. When the parison is made just prior to the blow molding by the machine, it is called Extrusion Blow Molding. This is really a combination of extrusion molding AND blow molding. They are just combined into two processes on one machine. Naturally this can lower the labor required; however, the speed of the machine is slowed down based on how fast the extrusion for the parison takes, which is longer than the blow molding itself. Continuous and Intermittent variations exist within the extrusion blow molding category. Products typically made using blow molding technologies by Microdyne are hollow products such as nutritional, pharmaceutical, shampoo, and motor oil bottles, and personal care containers. Injection Blow Molding is used for small medical and single-serve bottles in large quantities. In this variation, molten plastic is fed into a hut runner manifold where it is injected into a heated mold cavity. 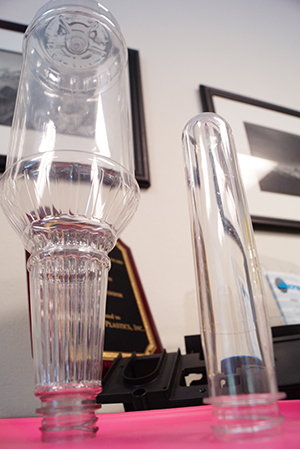 A preform, placed in the mold, is a fully formed bottleneck that has a long tube of plastic attached to it. This tube is then formed into the shape. The preform may also have a screw neck and is very accurate to accommodate a screw cap. Optionally these machines can do a leak test. Stretch Blow Molding differs in that the preform is manufactured in a separate injection molding machine and then run through a stretch blow molding machine, which stretches the preform the length of the bottle before being blown into the mold shape. These preforms can be molded with threads or other neck shapes. This method provides more flexibility in bottle design and shapes. Many types of modern plastic resins can be used in blow-molded plastic products. Microdyne Plastics specializes in extrusion blow molding and stretch blow molding. We manufacture blow-molded containers such as sports, vitamin, and juice bottles, condiment and pharmaceutical containers, wide-mouth jars for cosmetics and food, and promotional bottles. The above discussion of various blow molding methods illustrates the complexity of matching the tools with the machine and materials. Matching your product, based on its function, quantities, and other requirements usually can be done in several ways. Our approach is to utilize the best and most economical process for your needs. Open a dialog with our specialists on a container project you have by sending in this short quote form below.